Nearby Crater Lake Caldera. Wikimedia Commons, photographer Dagmara Mach. Sometimes our readers send in questions to us that literally sends the writers into a frenzy of volcanic exploration. This week’s question was about if the area between Fort Rock and Chemult in Oregon is indeed a large caldera. The area is situated south of the eastward Cascade volcanic range south of Newberry (Paulina Peak), and yes there are two Cascade volcanic lines. And to the west of Fort Rock/Christmas Lake-Maar Field containing some 400 maars and tuff cones, to the south you find the Yamsay Volcanic Shield and to the southwest Crater Lake Caldera (Mount Mazama). In all fairness it is not a bad hunting ground for a large Caldera. If you search for Fort Rock and look between Fort Rock and Chemult after turning on the terrain mode you will see the caldera feature clearly. If you turn to Google Maps and turn on the terrain mode you will see a fairly round caldera shape that is about 35 kilometers across. And here is one of the first hints that it probably is not a caldera that we are talking about. The volcanism in the area roughly spans 10 million years and for science to miss a caldera of that stupendous size in that short time-frame would be a surprise indeed since it would have created a 1 700 cubic kilometer tephra fall out. It is hard to miss things when they come in that size. Like most parts of the Cascade ranges this caldera like feature has also suffered from volcanism, there is an old tuya there and you also have one of Americas 5000 something Bald Mountains there. This version of Bald Mountain is a small Stratovolcano of unknown age and origin. But compared to the rest of the vicinity it is a low activity zone and that is partially the answer to why it looks like a caldera depression. Sorry for the bad art-work. In RED are major faults and fractures. In BLUE is the Yamsay. And in GREEN you have Bald Mountain and the un-named Tuya. Weird how the caldera disappeared. If we instead look for faultlines and fissures we find a lot of them. The caldera looking feature is actually surrounded on 3 sides by them and that creates what looks like caldera walls, but it is instead the result of local tectonic stress regimes causing escarpments. The southern end would have looked like a horseshoe if not for the large Yamsay Shield volcano; in this case it creates the southern “caldera” rim. Another thing, most large calderas tend to not be round in shape. Above 15 kilometers across large calderas tend to be more and more oblong or sometimes even more oddly shaped like Yellowstone, Toba and Tondano. To the best of my knowledge no VEI-8 eruption has caused a circular caldera, but there are quite a few circular VEI-7 calderas like nearby Crater Lake. Newberry Caldera. USGS/Lyn Topinka photo. Well, to be honest, had it been 40 kilometers to the east it would have been in a perfect position to be a caldera. Say hello and welcome to the failed VEI-8 zone of Newberry. During the last 10 million years there has been a progression of massively rhyolitic volcano centers that have moved towards the NNW. And Newberry is the current location of this progression. The area is absolutely dunked under by massive rhyolite flow-sheets (some 35 of them and counting). Nobody truly understands what causes this progression of re-melted crustal material. It is believed to be caused by regional crustal extension forming a basin and lateral flow of subduction melt from the Cascade Volcanic Arc (The western one). Still to this day there is a lot of old magma under the region and this is the reason that from time to time it is popping up a maar or two, and they are big maars to boot. Now and again the stale remnant magma is pushed up near the surface into the water-table and a phreato-magmatic detonation occurs and a nice maar forms. Sometimes the magma interacts with water in such a setting that a maar can’t form and instead you get a phreato-magmatic tuff cone. In some ways the progression of rhyolite volcanic centers ending at the current Newberry is as close as you can come to a VEI-8 able volcanic system without getting a supereruption. A hint to why this did not happen is probably to be found in the crustal extension itself. The basin formation probably leaves a too thin crust above the rhyolite to form a large over-pressured magma reservoir able to fire off a true supereruption. So, in the end the “Caldera” turned out to be a beautiful geologic place, a fluke wonder of nature, but not a caldera. As you may have noticed there is no weekly update this week. This is due to a technical malfunction caused by Tommys cat getting hold of a Howitzer that the cat used to blast Tommys modem into smithereens. Hopefully Tommy will have gotten hold of a new modem and that the cat will be leaving that one alone. If that happens there will be a new weekly update next Friday. Ohh myy… You are correct, I did not notice that as I made that image, but now I see a lot of them too. Apologies for the lack of an update, like Carl says, the cat has been chastised and had its howitzer removed and a new modem is heading my way. I do not think that most people understand how much effort goes into the pieces we publish, normally it takes from 4 hours up to day (and even weeks) to do the writing and editing. And now and then a technical mishap will happen that puts one of us out of commission for a week or two. That is why we are many writers and also why we try to have a surplus of pieces to publish. But, now and then we have to become a day late, or leave out publishing entirely due to circumstances like this. On SR 79, near the Carryville exit, is a side road that runs out into the swampland near the Choctawhatchee river flood plain. It’s called “Dram Rd.” Usually roads are named for some reason, and “dram” is not a common thing or expression used around here (at least, any more). The other reason for road names is developers trying to evoke something interesting in a buyers mind. (the same reason that “signal hill” subdivision is in a gully. But, roads such as “Dram” predate the predatory subdivision developers, so it has that name for a reason. It’s possible that many years ago, that was where one could go to get a drink, dunno, it just caught my attention for it’s odd name. Oh yes, I really DO understand how much work is involved. Actually I’m certain you undrestimate how much. If you really knew, you wouldn’t even start!!! usually were hidden in smoke.. Remember a cockpit debate about whether a Maar was Meteoric or Volcanic in origin- I voted for Volcanic.. Funny word “Meteoric”. It also can indicate a source of water. “Meteoric” being rain. And Hitler suffered from meteorism. Or perhaps it’d be more apt to say that those around him suffered from his meteorism. meteoric is used for something that fell from the sky. It doesn’t ask how it got in the sky, apart from excluding man-made objects. Rain qualifies. Or maybe more people appreciate your efforts than you know. Unlikely – the geologists and scientists can generally discern the differences. A rhyolite flow will have typical characteristics of a lava flow. Coulees, levees, and a general direction of the flow itself. Also, there are usually noticeable characteristics that differentiate ignimbrite from a flow. That being said, the initiation of the flow was probably explosive, and probably only turned effusive after the degassed explosive phase was over. If this is the case, hard to say. 1907 sources aren’t the most reliable haha. I do know there are quite a good deal of legitimate rhyolitic lava flows. We saw one at Cordon Caulle. I read an article not too long ago that detailed how they believe most rhyolite flows do start out with an initial phase that is highly explosive, and that you only get the actual flows themselves after the magma has degassed enough. Personally, I wouldn’t say they’re as rare as you think, but rhyolitic eruptions of any form aren’t particularly frequent regardless of the situation. Just to be a bit knobby here… But there is a Rhyolite flow in the picture used in this article from Newberry. It is that boring grey blob on the righthand side of the image. Indeed you are right Michael, it is an obsidian flow. Newberry Volcanic Center is though well known for its rhyolite flows. And yes, they are rare. Normally rhyolites are not flowing, but make for rather beautiful domes. Another spot with rhyolite flows is Heidarspordur in Iceland and nearby Krafla. The reason for those two sprouting rhyolite flows is that the rhyolite is kept hot so it is still able to flow. But the flows are small. We are quite convinced that you are Geyser in a new version. As such I recommend threading very lightly with snarky remarks until we are done investigating things. Just to be quite clear. It is one more slip-up and off you go to just make certain we are not being Geysered. I have some stones from one of the rhyolite flows near Aurora/NV in my collection. First is a cut and polished agate filled classic thunderegg (aka lithophysa) with starpointed cavities, which sometime occur in rhyolite flows. In second piece, lot is going on. It has many gaspockets with rounded shapes, you can see the flowbands in the rhyolite. to give a better idea of the stones structure in last piece, a close up. Fan-bloomin-tastic. Quite apart from their intrinsic beauty, I absolutely love the sense of time standing still that you get from those cross sections. Thanks for posting them. ROFLOL! Love the comment intro sentence. Nothing like starting off on a confident foot! I don’t know the protocol here for photos and such but i have some pictures of Rhyolite boulders and a big sample filled with quartz sphericules I collected in Mogollon NM by the mines. Had 9 inches of rain on a burn scar over 45 minutes that was channeled into a narrow valley and scoured down to bedrock. Sad thing is a coworker did the section by the mine dumps. I only had a couple hours to pick through rather than a full week. She spent the whole time in the car reading. Not a rock geek. Oh the horror! THE HORROR! GL Edit: Thank you for getting to this one. I was looking at it and figured it best be left to the more senior admin to make the call. The one at the Azores is very interesting. Nobody knows exactly what it is, best guess is that it is a spread-center of some sort. It also runs under the Islas Formigas and caused them to pop up. Another guess I have heard is that it is an old meteor strike. A meteor strike seems a bit of an odd theory I think. 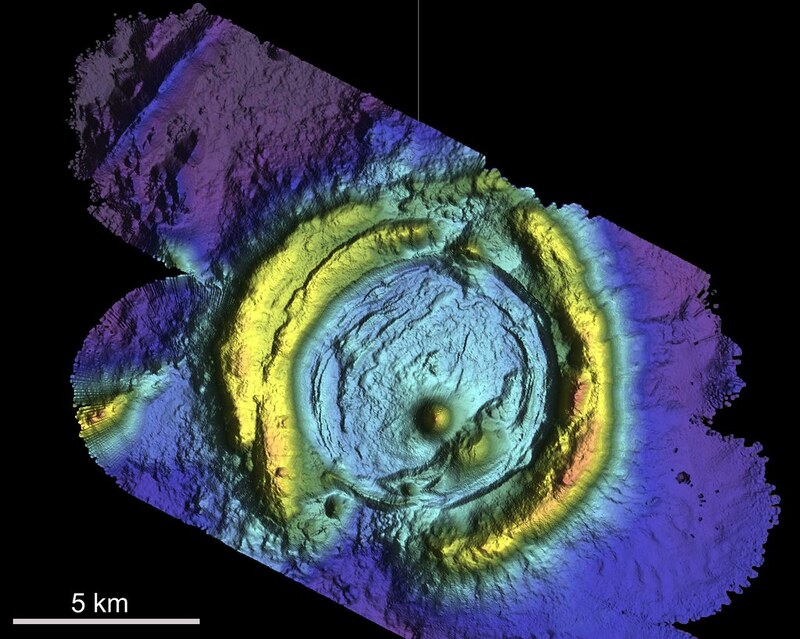 And given the fact that the crater is roughly 100km across on an ocean floor that isn’t really old, there’d have to be some sort of record of that. But then again, if it were a volcanic caldera, there would also be some sort of evidence of its formation. So some sort of spread-center might indeed be the most logical thing. Personally I am in favor of the spreading center. Probably driven by the hotspot, I have though not seen any data on where it is centered. They are of very similar depth, are quite close in the same quadrant on the rim of the caldera, both look the same on the drumplots (so far as I can remember Tuesday’s), and neither have much, if any associated tremor. Yet one is thought to be due to blocking and the other not: can someone explain why the two are thought to have different characters, please? Er, well. Another careless mistake on my part. I misread the depth; they aren’t at all similar. Apologies all. The quakes locations since the end of the eruption have followed the same location and density as during the eruption which I think would suggest continued settling. 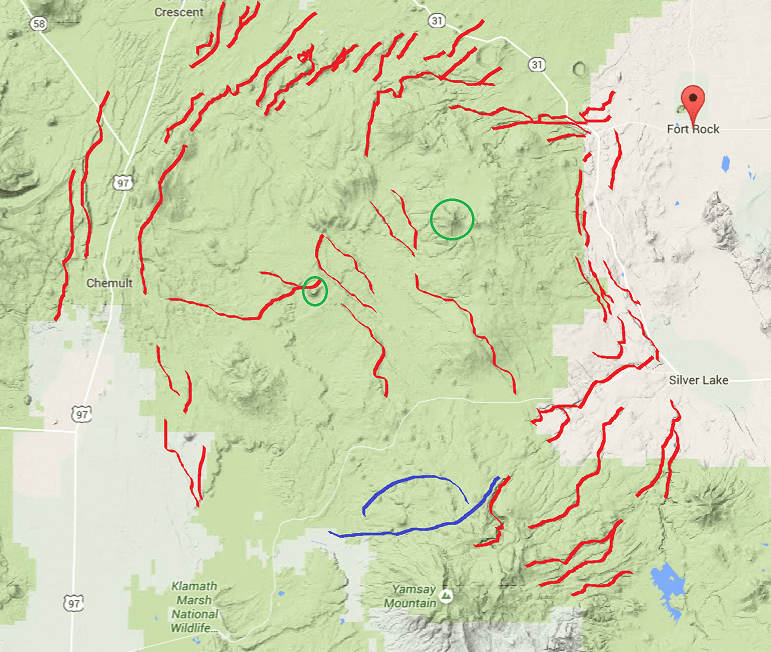 The only slight difference, there are a few more located on the northwest and southwest quadrants of the caldera rim. Also, they are all happening above 10km, there are next to no deep quakes greater than M2.5 deeper than 10km. What is interesting, most of the GPS readings are on the rise except Grims which appears to be falling although this time of the year it could be ice issues. In spite of Grims, wouldn’t it be a normal thing to expect inflation after a large deflation? You must take into account that the crust is spreading, this makes it possible for Bárdarbunga and Grimsvötn volcanoes to receive a magmatic influx while not seemingly inflating. There is a lot going on at GPS-stations around the eastern volcanic zone and you have to take into account all that is happening. Grimsvötn is probably redistributing magma from one reservoir into another. The previous shallow magma intrusion occured in a magma chamber under Háabunga and now it is probably migrating into another magma chamber, either in the caldera north of the Nunatak where the GPS is, or further down the fissure swarm. 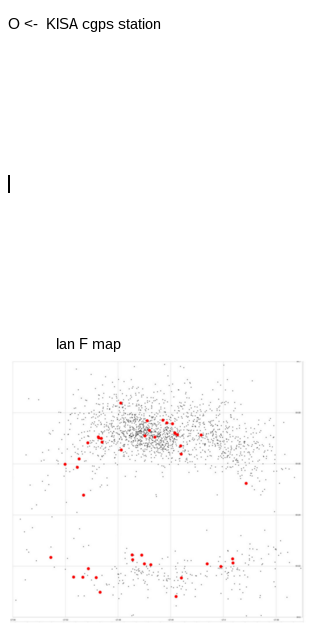 This is a really quick down and dirty plot showing all the M2.5+ quakes that happened during the eruption (small black dots) and since the eruption stopped (March 2015) in red dots. It really makes the point of resettling come home. One should remember that the earthquakes during the eruption was caused by outgoing magma causing the caldera “plug” to fall downwards. And to see the larger earthquakes continue at the same place afterwards tells a story of continued dropping. Thanks, Ian F. The KISA plot is interesting to me because it’s been showing inflation since the M3 eqs began again on a fairly regular basis at the end of last year. Though as Carl’s post implies, it can be unwise to infer causation from correlation. The up-value is just one value. You also have to know the exact location and in what direction the poor station is moving. As a follow up to the title of this posting: something which has puzzled me Do the amphitheatres formed by flank collapse -eg St Helens- count as ‘calderas’? They are after all collapse features albeit ones where the collapse has been outwards rather than in And if not, what would be an appropriate term for them? What does the team think? Simple answer, no it is not a caldera. It is a collapse escarpment. The processes are just a bit to different for making it viable to use the caldera moniker on St Helens. The key difference being as you observed. Outward expulsion vs inward collapse as the dominant forming mechsnism. etc. The Kingsley C.O. a bird Colonel was not happy. happy. The 10 year old boy who was on the trail, with his parents was ecstatic. He was visited by some Marine aviators while getting Chemo the day before. Everyone kept the same story..
quite interesting for the area that Carl posted. Scientist in another field (not geoscience) and addicted to science reading in general. Volcano cafe has been a favorite spot ssince I found it. Thanks to all of you who contribute with exciting and educating posts and comments! Now a short question. Trying to find back a post explaining how to interpret drumplots. Maybe it was Geolurking who posted it? Someone who could help find it? Hm, seems like I started a series that I never got around to finish. Here is part two with a link to part 1. Here is a piece that Geolurking wrote about Seismometers. And one of the learned regulars on here – Henrik, iirc – had an article ?last year on the related topic of reading tremor guages, but I’ve not been able to track it down. If anyone noticed comments coming and going in a mysterious fashion it was just me that bungled up the comment threading. It had to be fixed or the comments would have ended up pretty much anywhere, or not showing at all. and HAU is showing something, flood maybe? I wonder if that was the Afghanistan 6.6 earthquake at 10.28am, rattling the seismometer? That’s what I am thinking it was, that quake was very deep and the signal shows all over Iceland. It was indeed the Afghan-quake. It looks so odd because it is intermingled with 3 local small quakes. In regards of Grimsvötn I am more lining to it being people up on Vatnajökull driving around. I think it may be IMO since Vöttur came back online at about the same time. The Haukadalur hubbub is intriguing, it may indeed be a spring flood, but I do not remember that it looks like that. There was also a bit of earthquakes there recently, so it might be related to that. Thanks for very pedagogic posts on waves and seismometers! I will look at the drumplots with new eyes! While we’re on the topic of discussing interesting calderas, specifically those that may or may not be volcanic, and may be oceanic, I wanted to share one of the most interesting volcanoes in the world (in my opinion). This volcano is Niuatahi in the northern Tonga arc. I came across this perusing google earth a while back, and I was fairly sure it had to be a volcano. Later on, it was marked in the GVP, which verified its volcanic nature. It’s an extremely interesting caldera. Not only is it enormous (roughly 15 kilometers across), it’s almost a perfect circle sitting fairly deep in the ocean. This picture below shows just how odd it seems in relation to everything else around it. Just figured I’d share an interesting volcano. Just to share one aspect I found odd about this volcano – the caldera seems to imply in some ways that this was once a large stratovolcano of sort, at least the circular ridge that surrounds the hole would imply there was once a larger edifice there that collapsed into the central hole after a large eruption. This would be the normal assumption in a volcanic arc with a caldera, especially a caldera that is surrounded by heightened topagraphy outside the depression itself. But the topography is extremely odd. The sides of the circular ring that surround the depression are extremely steep – especially for what would have been the base of a stratovolcano. If you were to continue the slope from the side of the ring and project it as a pre-collapse stratovolcano, you would get a ridiculously steep and very tall volcano – almost comically steep if we’re being honest. There are a lot of other oddities at this volcano. Even the fact that it is dacitic strikes me as somewhat odd. Perhaps, between doming due to deep upwelling magma and a lower sea level then, the volcano had its feet in shallow water and most of its edifice above water during the last glaciation. It would then have resembled Krakatau. An explosive eruption, likely phreatomagmatic, blew it up and the collapsed ramparts sank into the sea, where the water providing more support than air allowed the steep-sided rubble piles. The doming went away as this and other eruptions depleted the deep reservoir feeding this and nearby systems, and when the glaciation ended, sea level increased, plunging the caldera into Davy Jones’s locker. Alternatively, the volcano may have been largely or entirely submerged even then, but at shallow enough depth for the upper part to explode (not too much pressure above). Of course, “high-VEI explosion” isn’t the direct mechanism of caldera formation, *collapse* is. So another possible mechanism is that it pulled a Bardy, with a lateral eruption through a vent somewhere else hollowing out the mountain’s guts and leading to collapse, even under pressures that prevent explosive volcanism. A magma chamber roof failure might still do it as well, just without the usual accompanying pyrotechnics, underneath high pressure fluids. Wow, that is nice. This deep under water you cannot get explosive eruptions: the water pressure prevents explosions (which is why black smokers are so well behaved). A caldera means the magma chamber emptied, probably not from the peak of the volcano but like Bardarbunga, through a dyke to a site some distance away. We can speculate where: in Bardarbunga the dyke followed the gradient of the surface and erupted at a lower level (gravity is a powerful force). If the same happened here the eruption could have been where the label ‘Q327’ is pointing, perhaps 20km away. The gap in the caldera ring on the SW side could mean that magma emptied below this position as well (playing the role of the NE side of the caldera ring of Bardarbunga). A pretty big eruption: the hole seems to be about 50km3. I would guess that the double wall may mean there were at least two eruptions. A double Laki. Of course this is pure speculation! How do you get the volume of 50km3? From the 15km diameter, and assuming a caldera depth equal to the height of new volcano (700 meter). It is a rough estimate. Ah okay, was just curious if there was a good formula for doing so. I’m not sure I’m sold on this being effusive. That’s a big caldera, and a volcanic system that is predominantly dacitic. If this were an effusive caldera created gradually, it would have to be the world’s largest gradual-creation caldera, would it not? In order to get a collapse of a caldera, regardless of whether it’s gradual or sudden, you need under-pressure. In other words, you need the magma chamber to empty out significantly, resulting in empty space, which would structurally cause the overlying roof to collapse in on itself. In big explosive caldera collapses, you get this under-pressure due to the explosive gases forcing out way more material than would normally occur if the gaseous component wasn’t there. If it weren’t for the explosive gases, it would behave much more similar to a hydraulic pump, where the fluid would move to a point of high pressure towards the point of low pressure until it reaches equilibrium. But the important thing here, is that without the explosive gaseous component, the pressure equilibrium would stabilize before emptying out any excess magma, which would prevent the case of under-pressure. Now, obviously, we know for a fact many caldera collapses have occurred gradually, so this is clearly a thing that can happen, but none are nearly this size, and most have other components that allow the fluid to drain from the magma chamber, making it so that the pressure wouldn’t reach equilibrium until there is a significant under-pressure in the magma chamber. In Bardarbunga’s case, the rifting and gravity differential likely causes this. In other volcanoes, the magma often drains from a high magma chamber into lower regions (hawaii, other island arcs). Each of these scenarios mechanically requires a high magma chamber and a lower region for the magma to drain into. I don’t really see this here as much, although I shouldn’t entirely discount rifting as you mentioned. So personally, I think this was explosive, but I think it was likely sub-aquatic explosive similar to the Havre seamount eruption in 2012. The problem with this is the pressure of the water. At these pressures (1-2km water column!) the gas doesn’t come out of the solution. Normally, as pressure reduces more of the gas comes out of the gas and this is what makes it explode: the example is opening an overpressured bottle of fizzy drink. Do the same at high water pressure and you’ll find the fizzy drink does not explode. To get an explosion that deep, you need something else that explodes. It is certainly big, but for instance Lake Toba (much bigger!) didn’t explode either. It is a collapse structure – the magma erupted from the ring fault, probably with huge fountaining but not with a Pinatubo boom. I do not entirely agree with you. If I remember nucleation of volatiles in magma happen between 1200 meters and 2000 meters depth. Now, the over-burden there is normally weighing 2.7kg per cubic decimeter whereas water is roughly 1kg. So, the gas could nucleate into one compact gas stream dragging along the ash in an explosive manner. If memory serves Grimsvötn Lake is 550 meters of water and 200 to 300 meter of ice and it can merrily explode. Also, the edifice was probably higher, it is likely that the central volcano was above water as it went pork belly. Recorded subsea explosions are mainly less than 300 meter deep. There is one case of an explosive eruption at 700 meter (the press release said 900-1500 meter but this seems an overstatement). Yes, the volcano would have been higher than this but it is now at 2km depth. The final explosion would have needed to be at something approaching this depth. I think collapse is a more likely explanation. But it is certainly worth a closer look. The reason for the steep sidedness is the same as forms a Tuya. As the magma at the center is expelled the lava can only flow that far before it solidifies, and the water will function partially as ice due to the high pressure. Severely steep sides are legio around marine volcanoes, that is what makes them so unstable and prone for collapse. 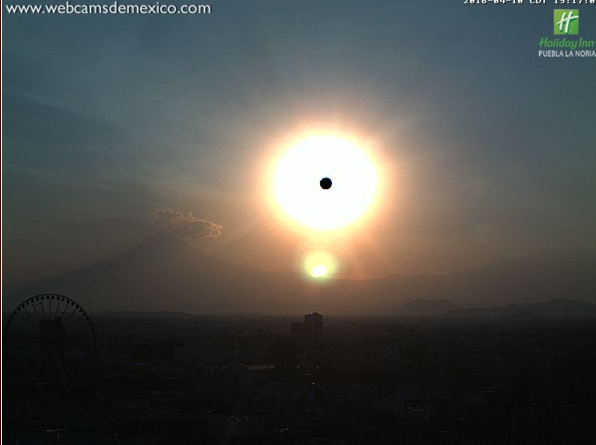 i was browsing images and this one of Popocatepetl has a dot in front of the sun. I presume this is a camera artifact. btw, Popo had a burp today. Another bit from the Oregon Dept. of Geology. The second part of the Grimsvötn two part series is now up!